Making your home safe for your baby is an important step in becoming a parent. Many homes contain hazards that are well within reach of babies and toddlers. When preparing your home for your baby, be sure to take a tally of each room – make a map if possible, and figure out where to move things to make each room safe for your child. The most common accidents for children under the age of 5 are injuries involving burns. It’s important to remember this when taking a look around your home. Make sure that every available outlet in your home has an outlet protector on it; keep extra outlet protectors available in case one is lost. If your family can afford it, invest in outlet covers that come equipped with a sliding latch. Be sure to cover any open electrical outlets on extension cords with electrical tape. Electrical safety for children is important. As your child grows, you must babyproof things higher up. Knobs for stoves and low-placed appliances will have to be moved to higher areas or removed from the room completely. Poisoning is another very common injury for children. 99% of households keep cleaning agents under the sink. For that reason, it’s important to invest in child proof cabinet locks. Use these locks for any cabinet that contains harmful items or items that can choke, cut, or burn your child. Even if you don’t think your child will drink something dangerous, they may open a container of something caustic, which blinds children. Salt is another potential poison. It takes just a tablespoon and a half to kill a 25 lb child. Keep all chemicals, cleaning agents, and cosmetic items in locked cabinets high up where children cannot reach them. Bathrooms are another danger area for children. Young ones can drown in as little as two inches of water, and it’s amazing how quickly they can get themselves in dangerous situations. Always keep a close eye on your children in the bathroom. Install a toilet seat lock to keep your child from opening up the toilet, and never leave a child unattended while bathing. Child electrical safety is another factor when babyproofing in the bathroom, as electrical appliances can be pulled or fall into the bathtub. Never use electrical items while a member of the family is in the bathtub or shower. Head injuries are one of the scariest things that can happen to a child. Even a small uneventful run-in or fall can cause a large bump to rise on the child’s head. 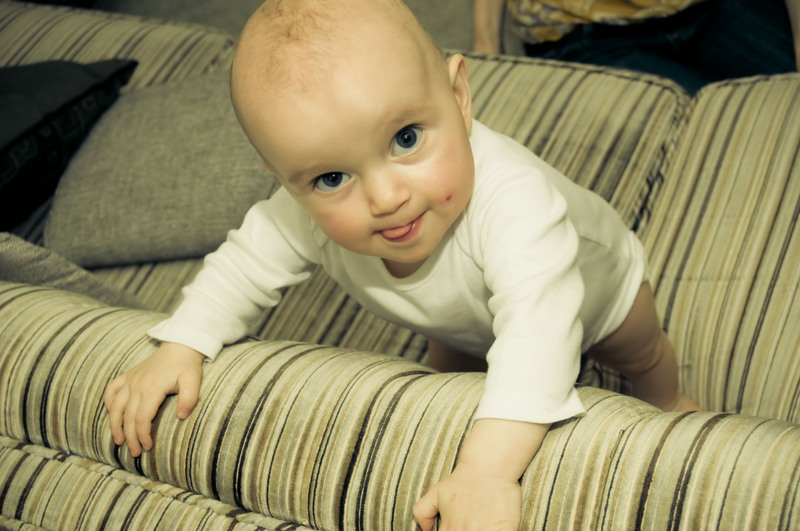 Use foam bumpers to surround furniture with small edges, and never leave a child (especially an infant) unattended on a couch, bed, or counter. Always move items out of baby’s reach that can be grabbed or pulled down, such as books, picture frames, or knick knacks. Strangulation is another concern for parents. Items like necklaces, shoelaces, strings or blinds can also get wrapped around a child’s neck very easily. Always shorten blind cords, and keep an eye on children while they play with toys that have strings. Railings are also a potential for danger. Check railings on staircases to make sure that the gap is no wider than 3.5 inches. If the gap is larger than this, install acrylic sheeting or netting to prevent your child’s head from getting stuck between the rails.